Hamilton Academical fans must "get behind" player-manager Martin Canning after Tuesday's 8-1 defeat by Celtic, says chairman Les Gray. Accies have gone eight games without a win, won only one of their past 15 in all competitions and sit third bottom in the Premiership. "Together we can make the difference. Divided we'll fail," said Gray. "We believe that our players and management team will come through this difficult period with our support." He added: "We would ask that our fans get behind the manager and the players during this difficult run of results. "Obviously recent results have been very disappointing, but we have been here before in previous seasons. "Together we all hurt when things are not going as we would wish, but fans, community, players, staff, management and directors in alignment are what makes our club what it is." Canning, 34, took over as caretaker manager a year ago after the departure of manager Alex Neil to Norwich City. They went 13 games without a victory under the 34-year-old but ended last season with only one defeat in their final five games and made a promising start to the current campaign. 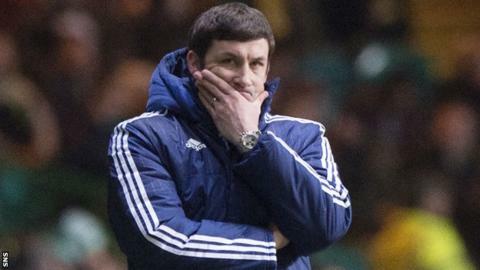 Gray said the 8-1 defeat, which Celtic manager Ronny Deila said could have been heavier, was out of character and backed Canning to turn round the recent poor run. "We have had positive results against the vast majority of Premiership teams this season and it was only around six weeks ago that we were sitting fifth in the table, therefore demonstrating that things can change very quickly," Gray added. "We will continue our policy of developing our own young players, which has proven to be very successful, and we will continue to search for the players that can augment what we do within our budget, which can prove very difficult."